Plus many more appearing here for the first time in book form. This is a sister volume to The Best Science Fiction of Isaac Asimov and not quite up to the same level as its companion. The problems are that Asimov didn’t write as many mysteries as science fiction stories (and so there are fewer to choose from) and his general quality as a mystery writer is rather below his general quality as a science fiction writer. This doesn’t mean that this book is bad—but if I had to own only one of it and The Best Science Fiction of Isaac Asimov, I would opt for the latter without hesitation. The book comes divided into three sections: Black Widower stories, Union Club stories, and others. The Black Widower stories are, indeed among the best and include several of my favorites, such as “The Cross of Lorraine,” “Yankee Doodle Went to Town,” “Can You Prove It?” and “The Redhead.” On the other hand, “Sixty Million Trillion Combinations” is one that has never worked for me particularly. Still, we have a good sample of general solid pieces for the Black Widower end. The middle section, of Union Club mysteries, is perhaps the weakest. There is, of course, a smaller pool of these to draw on: those appearing in the one Union Club anthology (The Union Club Mysteries), and a smattering of previously uncollected specimens. They are shorter, more stereotyped, and less interesting on the whole than the Black Widower stories, and so there is little to recommend the middle section here. On the other hand, the final section is perhaps the strongest. It actually includes “The Key,” one of the best of the Wendell Urth stories found in Asimov’s Mysteries, and among Asimov’s better mysteries overall. It also includes Asimov’s favorite “Larry” mystery from The Key Word and Other Mysteries (not my favorite, perhaps, but it’s nice to see Larry squeak into the volume). And it is climaxed with a cute little story, “Nothing Might Happen” which isn’t really much of a “mystery,” but is a crime story with a fun twist at the end. 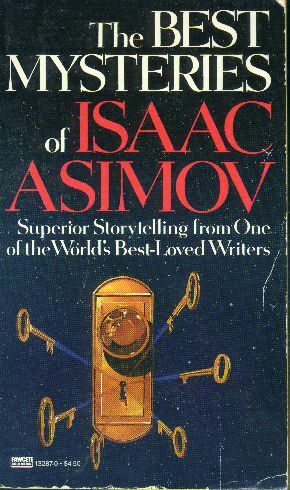 On the whole, I would definitely recommend this volume for the Asimov fan as the best example of his shorter mystery writing. On the other hand, I still think that The Caves of Steel is his best mystery story bar none and would strongly recommend it over this book as an example of Asimov’s mystery writing.